Sandy Wexler, Sandler’s newest Netflix project, has a slightly hipper collection of celebrities on hand. They walk through the movie pretending to know the title character, an oddball showbiz hanger-on. In addition to the usual Saturday Night Live classmates (Chris Rock, Jon Lovitz, David Spade, Dana Carvey), Jewel, Lisa Loeb, Conan O’Brien, Janeane Garofalo, Jimmy Kimmel, Mike Judge, and Judd Apatow (plus the apparently unavoidable Vanilla Ice) all describe run-ins with this nebbishy eccentric who managed a series of go-nowhere clients in Los Angeles in the ’90s. It’s sort of a Gen X, West Coast version of the Woody Allen comedy Broadway Danny Rose. But while that movie used the iconic Carnegie Deli to tell Danny Rose stories, Wexler collects its testimonial-givers in a generic, windowless reception room. It’s part of the production’s overall TV-movie cheapness—and if that’s indicative of one of many ways that Happy Madison’s craft falls short of Woody Allen’s, it’s also appropriate for a movie about a chronic small-timer, in a city with perhaps somewhat less character than Allen’s New York. Sandy’s motley group includes a ventriloquist, a professional wrestler, and an ill-fated daredevil, but he tries his best, and so, surprisingly, does Sandler himself. At this point in his career, his old critical bugaboos—affectations like a funny voice or a shuffling walk—have become the surest signs that the Sandman is actually engaging with his character, and that’s the case here. Sandy speaks in a whiny mumble, wears old-man glasses, and often punctuates other people’s jokes, good or bad, with a fake cackle and clap. His other major vocal tic involves transparently lying and then lying about his lies (“I never said that,” etc.). The break from Sandler playing a cranky suburban family man is as clear, crisp, and refreshing as the sodas he still uses as product-placed set dressings. While many recent Sandler semi-characters tend to live in well-appointed mansions, Sandy rents a modest pool house on a mostly unoccupied estate (owned by a wealthy but out-of-country businessman) where he is not permitted to use the pool. When he comes home, he is habitually chased by fearsome guard dogs. This is all still Sandler shtick, replete with endless running gags, but it’s also surprisingly endearing and often quite funny. 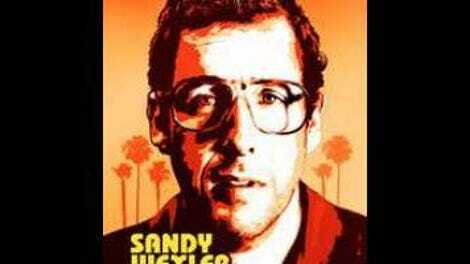 In its cartoony way, it feels truthful; maybe Sandler identifies with Sandy’s hustle after years of securing starring vehicles for the likes of Allen Covert and Nick Swardson. Whatever its origins, there’s a striking oddness to a shot of Sandler shuffling through an amusement park, rambling through an anecdote about Frank Gorshin (the Riddler from TV’s Batman) while a couple of kids in his care obliviously cartwheel alongside him. The amusement park is where Sandy happens upon Courtney Clarke (Jennifer Hudson), performing for children with her big, soaring voice. Sandy is immediately smitten: with her talent, and also with her charming, unpretentious manner. She’s taken with his faith in her, but as her career begins to take off, it becomes apparent that Sandy may be in over his head both professionally and personally. By making Hudson an object of romantic affection, however chaste and seemingly unrequited, Sandler moves into a less flattering (if somewhat era-appropriate) version of Woody Allen imitation, mimicking the writer-director’s ’90s propensity for uncomfortably mismatched love interests. (Sandler himself is no stranger to this land, pairing himself with a number of decade-plus-younger starlets over the years.) But the Wexler character, encouraging his clients with bizarre showbiz fibs (“Liza Minnelli used to sing in a coal mine”) is engaging enough to overcome the cringeworthy romantic overtones—at least for the first hour. That Sandy Wexler has a full second hour (and another 10 minutes after that) is indicative of the movie’s pokiness. The occasional bloat of Sandler’s old buddy Judd Apatow has nothing on Happy Madison stalwart Steven Brill making time for a series of belabored recording-studio-mishap gags and Nick Swardson slapstick, as the catch-all setting of 1994 (initially treated like The Wedding Singer’s generic 1985) expands to the back half of the decade. Yet even the Swardson bits are more tolerable this time out (after a bungled stunt early in the movie, Sandy insists on his client’s behalf that the sky be cleared of “all birds” before he performs again). This is the least vulgar and least bullying Sandler movie in ages; the only vestige of typical Happy Madison crassness is the glaze of sentiment, which smothers the material far less than usual. Maybe it’s a question of drastically lowered expectations finally working to Sandler’s advantage, but Sandy Wexler is disarming in its charms. It still lacks the courage of a great comedy, or the sharpness of a very good one. Sandy is something of a self-sacrificing white savior for Courtney, a condition only partially ameliorated by the number of black actors in the cast, including New Girl’s Lamorne Morris and an ever-game Terry Crews. Yet Sandler is also too enamored of his own unlikely success to let Wexler stay a Danny Rose-style professional loser, even to romanticize him. Instead, he has to learn a rushed, belated, and pat lesson about honesty, and if Sandy Wexler isn’t a daft, truth-bending yet basically trustworthy small-timer, who exactly is he? The movie is profoundly uninterested in this question. But it does show signs that Sandler and company still think about show business in terms beyond having a beer in paradise with David Spade.